A small swivel head, adjustable in both the A and B axes, with limited overtravel protection. The probe is offset from the mounting shank Z axis. A compact, vertical probe head for a single probe, with an integral cable. 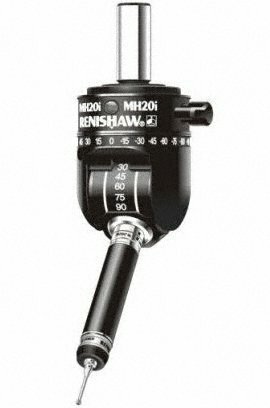 Note: Other shank/cable combinations are available, please contact Renishaw for your exact requirements. The PH6A is designed for use with autojoint probes and allows you to change probes or add extensions without having to requalify the probe. Special order only. The MH8, positionally repeatable in 168 positions, is designed for use on small manual CMMs with short probe extensions and carries M8 probes. The manually indexable head (MIH) that is positionally repeatable in 720 positions and features an LCD display and autojoint probe mount. The MIH is designed for use with long probe extensions for larger components. The MIH-S (manual indexable head - serial) is an enhanced version of the standard MIH which provides feedback of status and lock position to the CMM computer over an RS232 link via the MIH-SI interface. identify the position which the MIH-S has been locked into. Measurement performance, functionality and dimensions as the same as for the standard MIH. An MIH-SI (Part no. A-1373-0150) is required for feedback of status and lock position. For the separate probe signal positioning a Renishaw probe interface such as PI4-2 will also be required. The A axis rotates through 180 in the X-Y plane. The B axis rotates through 90 in the Z plane. A lever locks the head in one of up to 168 repeatable positions, set at 15 increments. Modules can be repeatably changed in each position without re-qualification, providing qualification has taken place in each position with each stylus/module combination.